This linked to a blog post "Social media challenges and benefits for pharmaceutical companies" by Rodica Ceslov, president of Wild Frog Studio, "a dynamic full-service firm helping companies create go-to-market strategies and execute product launches for new products, new product line extensions and re-packaging existing products." The full quote from Ceslov is "the FDA social media regulations for pharma marketing are extremely strict, and at the same time still somewhat ambiguous, lacking clear structural boundaries that are needed to prevent unwarranted issues." 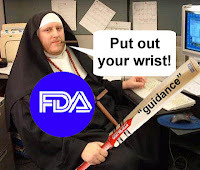 How can FDA social media regulations be "extremely strict" when there are NO such regulations (ambiguous or otherwise)? What the drug industry is looking for is "guidance" regarding how the FDA will interpret existing regulations, which are media agnostic. Even if FDA does issue such guidance, it is not legally binding. Some pharma companies -- eg, Pfizer -- are looking for new regulations, which would be legally-binding (read "Pfizer Asks for New FDA Regulations, Not Guidance, for Social Media"). So far, however, no pharma social media communication/campaign has been cited by the FDA for violating any regulations unless the communication overstates efficacy or understates risks (ie, says things that are against regulations no matter what the medium). The FDA has come out with guidance on responding to unsolicited requests, which include guidance on how to handle off-label drug information requests via social media such as YouTube and blogs (read "FDA Guidance on Responding to Unsolicited Requests for Off-Label Information Via Social Media"). This guidance is actually neither very strict nor very ambiguous. So stop blaming the FDA for preventing pharma companies from using social media! P.S. Ms. Ceslov works for an agency that obviously wants more pharma clients. Her blog post promotes a "3 Step eBook" called "How to Succeed in Social Media." My advice to pharma on how to succeed in social media is this: pick your outside agencies with care. For more on that, read "PR vs Interactive: Agencies Vie for Pharma Social Media Campaign Crumbs." John, the link to the blog is no longer live. Not sure if they took down the post or you have a bad link.